Sunday, May 27, 2018, marks the 29th annual broadcast of The National Memorial Day Concert, bringing Americans together to honor the service and sacrifice of U.S. men and women in uniform, military families, and all those who have given their lives for their country. Don’t miss it airing live on CPTV at 8 p.m., with an encore airing immediately after, at 9:30 p.m.
Acclaimed actors Joe Mantegna and Gary Sinise return as co-hosts of this special event. Also returning is the National Symphony Orchestra, under the direction of top pops conductor Jack Everly. Plus, an all-star lineup of actors, musicians, and other guests will participate, including General Colin L. Powell USA (Ret. ); actor and country singer Charles Esten (Nashville); three-time Grammy nominee singer/songwriter Leona Lewis; acclaimed tenor and Broadway star Alfie Boe (Les Misérables); and many others. Also participating are the U.S Joint Chiefs of Staff with the U.S. Army Herald Trumpets; the U.S. Army Chorus and Army Voices; the Soldiers Chorus of the U.S. Army Field Band; the U.S. Navy Band Sea Chanters; the U.S. Air Force Singing Sergeants; and the Armed Forces Color Guard and Service Color Teams provided by the Military District of Washington, D.C.
Two buddies—Joe Annello and Hiroshi “Hershey” Miyamura—helped each other survive deadly combat during the Korean War, endured the unimaginable as POWs, and became American heroes—one receiving the Silver Star and the other the Medal of Honor. To mark the 70th anniversary of the Women’s Armed Services Integration Act, the concert pays tribute to the contributions of women in the U.S. military, including the story of Leigh Ann Hester, the first woman to receive the Silver Star for combat. Actresses Allison Janney and Mary McCormack will participate in this segment. This year also marks the 50th anniversary of the Battle of Khe Sanh, one of the fiercest battles of the Vietnam War. Actor Graham Greene shares the story of Purple Heart recipient Bill Rider, who was part of the battalion known as “The Walking Dead.” Rider has since dedicated his life to helping generations of service men and women who have experienced the trauma of war. 2018 marks the 150th anniversary of Memorial Day, originally known as Decoration Day, first commemorated at Arlington National Cemetery. 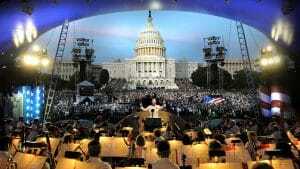 The National Memorial Day Concert airs live from the West Lawn of the U.S. Capitol before an audience of hundreds of thousands, a broadcast audience of millions, and to U.S. troops around the world via American Forces Network. In addition to airing on CPTV, the concert will also be live-streamed on PBS, You Tube, Facebook, and at www.pbs.org/national-memorial-day-concert, and will be available via Video on Demand from May 28 to June 10, 2018.